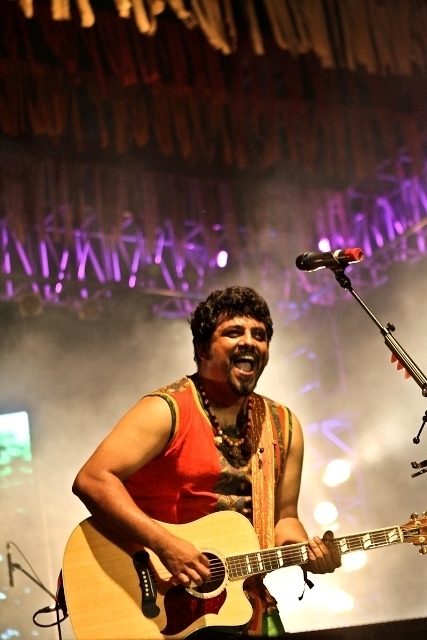 Just last month, a crowd of over 1,000 music enthusiasts gathered at Mumbaiâ€™s Cross Maidan for the first Folk Nations concert featuring artists from London, Cross Hands, Glasgow and New Delhi. Ross Ainslie, a young, buzzed-about piper from Glasgow, seemed to know his audience well. The multi-instrumentalist [Ainslie plays the bagpipes, flute, cittern and mandolin] recently collaborated with Assamese singer Papon [see video below]. â€œIndians like bagpipes,â€ Â said Ainslie launching into â€œLullaby For Mel,â€ an evocative homage to a friend. As predicted, the tinny sound of his border bagpipes had the crowd hooting for more. What the crowd didnâ€™t expect much later was Ainslieâ€™s rousing version of AC/DCâ€™s â€œThunderstruckâ€ that gave them more reason to cheer. Few in the audience were in the know that Ainslie understood his audience so well because he is also part of India Alba, a four-member folk fusion band formed back in 2003, two of whose members are based in New Delhi. For Akhu, frontman and founder of Imphal Talkies, collaborations such as Folk Nations are the reason why he kicked off the The Imphal Music Project. â€œI didnâ€™t really think of myself as a folk musician, although I have quite a few folk tunes with contemporary lyrics in my repertoire now,â€ says Akhu, who will perform tracks such as â€œEcheâ€ that he wrote back in 2010 when Manipuri social activist Irom Sharmila had completed 10 years of her protest against the the Armed Forces [Special Powers] Act [AFSPA, 1958]. Akhu will also bring along the Pena, a traditional string instrument from Manipur, for his 45-minute set. All bands on the Folk Nations stage on Friday will agree with Banerjee. Whether itâ€™s a song about a civilian losing his life to military violence, a love song set in Mysore or an Assamese boat song, folk music has given younger audiences a reason to connect with their roots and itâ€™s time it was feted with due ceremony. 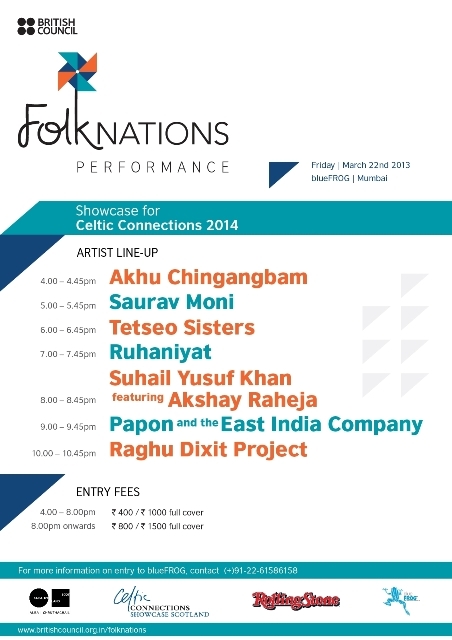 Folk Nations will be held on March 22nd at Blue Frog. Entry: 4-8pm Rs 400/Rs 1,000 full cover, 8 pm onwards Rs 800/Rs 1500 full cover.